Geneva motor show 2012: Honda CR-V | What Car? This is the new Honda CR-V, which has made its public debut at the Geneva motor show 2012. Honda unveiled the new CR-Vas a US-spec model at the LA Auto Show in 2011. The new European model shares most of the same bodywork, but has different engines, transmissions and interior and exterior trim. The European CR-V is also likely to have different chassis settings. European versions of the CR-V will be built at Hondas Swindon factory, which produces the new Civic. 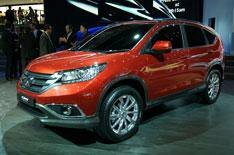 The CR-V is likely to use some of the same technology, including the CR-Vs 2.2-litre diesel engine. An updated 2.0-litre petrol is also likely. 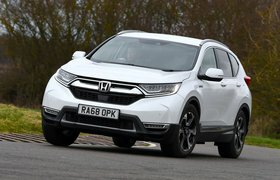 Technical details are yet to be confirmed, but wed expect the next CR-V to use a development of the current cars four-wheel-drive system, which only sends power only to the rear wheels if they start to slip. The new CR-V has a similar side window profile to the current car, but theres a bolder look at the front and rear. The new CR-V has also grown slightly, so it should be more practical; rumours of a seven-seat version have yet to be confirmed. the Geneva motor show next month.